PACs Programmable Automation Controllers - EES Corp.
A programmable automation controller (PAC) is a compact controller that combines the features and capabilities of a PC-based control system with that of a typical programmable logic controller (PLC). 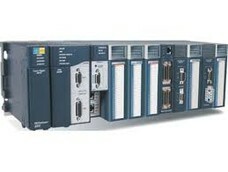 A PAC thus provides not only the reliability of a PLC, but also the task and computing power of a PC. The new GE Intelligent Platforms PACSystems delivers the first Programmable Automation Control – one control engine and one development environment for multiple hardware platforms. PACSystems offers enhanced processing and communications speed and programming capacity over existing PLC technologies for high-speed processing, data acquisition and memory-intensive tasks like recipe storage and data-logging. Take Control with Logix Platforms! As part of the Rockwell Automation Integrated Architecture, Logix platforms provide a single control architecture for discrete, drives, motion and process control systems. Whether you need a high-performance control system or a small, value-based control system, Logix platforms provide the right control system for your applications. Along with open networks, Kinetix integrated motion and visualization products, Logix platforms provide the maximum in control integration, program re-use, communication flexibility, and overall ease-of-use so you'll spend less on setup, operation, and maintenance.